A comforting winter dish - homemade polenta topped with mushrooms, chickpeas, tarragon and herbs. Vegan option. I’m short for words today… we’re in Chicago visiting my family this week, and I’m making a point to spend less time in front of the computer. Sometimes it’s just time to put the electronics away… to cut the habit of looking at your iphone every few minutes and relax a bit, you know? We made this warm and cozy meal last week with one of our favorite foods – mushrooms. It’s pretty simple… creamy polenta, chickpeas and a mix of sauteéd mushrooms & tarragon. They have these fancy ones right now at Whole Foods that are amazing, and more importantly – on sale. I just loved combining the texture of the oyster mushrooms with the tiny shimejis (and a few lesser expensive cremini’s to get more bang for my mushroom buck). Topped these with just a bit of asiago cheese and popped them under the broiler for just a few minutes. A warm yet bright meal… pretty much the opposite of what it looks like outside the window here right now. Brr. Serves: I filled 6 mini-ramekins as side dishes. Recipe serves about 3 as a main course. Make the polenta: Bring 3 cups of water to a boil with a few big pinches of salt. Gradually add the polenta while whisking. Continue whisking for a few minutes until smooth & not lumpy. 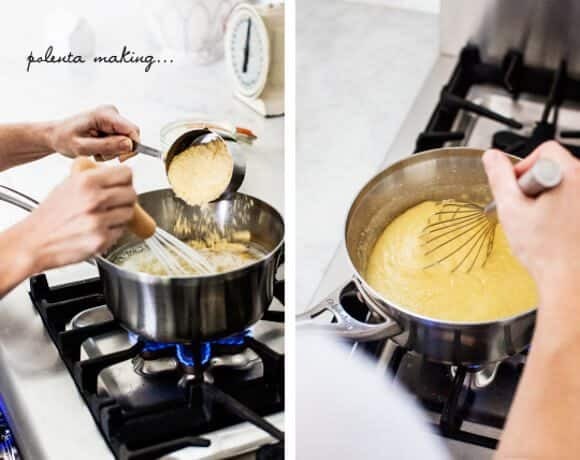 Continue cooking the polenta for 20-30 minutes, whisking often. Turn heat off, whisk in the garlic, olive oil, butter, salt, pepper & cheese. Taste and adjust seasonings. Set aside. Cook the mushrooms: In a large skillet, heat olive oil. Add the shallots, mushrooms and a few pinches of salt. Let the mushrooms cook for a few minutes, then add the chickpeas and the soy sauce. Cook until golden brown (8-10 minutes or so), stirring only occasionally. Add the sherry vinegar, stir, and let cook for 30 seconds or a minute longer. Remove from heat, stir in tarragon and chives. Taste and adjust seasonings. Scoop the polenta into ramekins and top with the mushrooms & chickpeas. optional step - top with a little bit more grated cheese and place under the broiler for a few minutes until bubbly. Feel free to serve in bowls or plates, the individual cocottes are cute but not completely necessary. A note about polenta - I used the Bob's Red Mill brand but I ground it in a coffee grinder to make the polenta more smooth and less course. If you use it right out of the bag, it's a little grittier... which is still fine and tasty if you're after that texture. Cook the mushrooms: In a large skillet, heat olive oil. Add mushrooms and a few pinches of salt. Let the mushrooms cook for a few minutes, then add the chickpeas and the soy sauce. This post is sponsored by Whole Foods, thank you for supporting the sponsors that support Love & Lemons. I hope you have good time with your family, you need some R&R. Simply love everything about this shoot and the meal looks mouthwatering. Looks good, but I’m confused by the recipe. When do you add the mushrooms to the polenta? 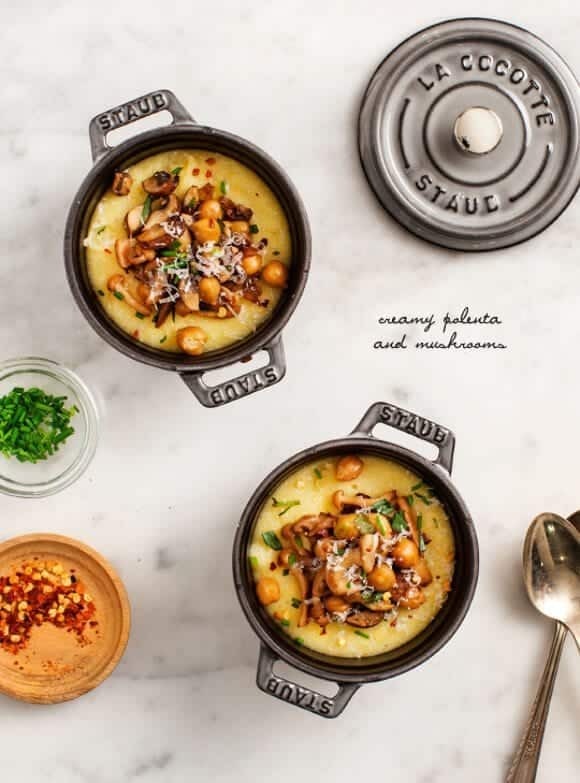 Did you bake the combined polenta-and-mushrooms in the mini Staub pots — or did you just use them as bowls to serve? I just updated the recipe to include the steps I left out… I put them in the mini pots just to serve, but I did pop them under the broiler for a few minutes at the very end (which is optional). You could serve this on plates just as easily. Great minds think alike! I just made creamy polenta with mushrooms yesterday! So good. Enjoy speeding time in Chicago. This looks so good. Perfect for a cold winter night! Yum! This is actually a classic Thanksgiving dish in our household. I cook my mushrooms low and slow with some stock and red wine. 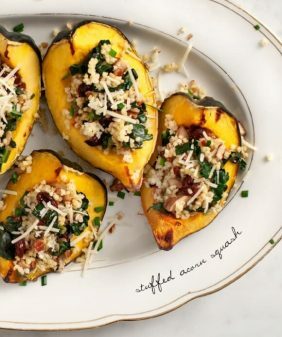 It is a perfect veggie side dish! This looks so good! I love looking at these pictures – so well taken! And I love those little Staub pots. Super cute! This looks so delicious. I love mushrooms and with polenta makes them even better. And I just love your photography. So beautiful. Enjoy the time away from the computer. This sounds delicious! I am curious… when do you add the minced garlic? Such beautiful pictures and such a lovely, comforting dish at this time of year. I like everything with mushrooms and your pictures of mushrooms itself are amazing. There’s definitely not enough polenta in my life. LOVE this! Gorgeous – perfectly hearty for this time of year. I wish Alberta had Whole Foods. No idea where I’d find mushrooms like those here. Your photos, as always, are outstanding. Please, please, please do a post about how you shoot such clear, light shots! Especially at dinner time when it is dark out.. well, it is up here! Mmmm! Nothing in more cozy than creamy polenta. Love the mushrooms! Have a great and relaxing time in Chicago! 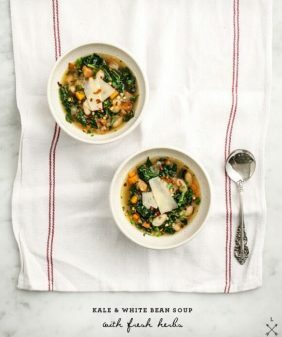 I have yet to try polenta but think this may be the perfect recipe to try it with! This dish shouts COMFORT FOOD! Oh how I would love to have a bowl of this goodness in front of me right now. hope you’re braving the cold, I can’t believe the weather down there! Hi Pang, hope they like it! 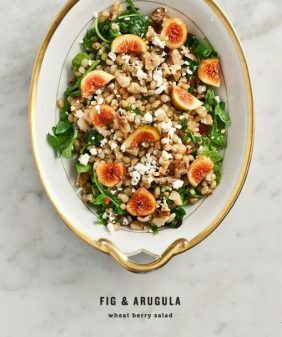 Sounds delicious, and looks beautiful!! Hi Jesse, Rosemary or sage would also be delicious. Add them earlier in the process since they’re heartier herbs… Basil would also work in place of the tarragon. I like to sauté mushrooms with some shallots and thyme. I also like to add chanterelles to risotto. Oh no! I have everything to make this except for the sherry vinegar. Any suggestions as to what I can substitute for it? Or can I omit it? Thank you for the recipe! Oh no worries, they came that way – the color is called graphite. I’ve just tried the recipe and it was delicious. I didn’t have the sherry vinegar but no worries 🙂 my husband really liked it. Delicious and easy. Thank you! I just made this and it was delicious!! Lazy person question: the handful of times I’ve made polenta, I’ve only cooked it about five minutes (once it turns thick), and while I cooked mine for about 20 for this recipe, it seemed pretty much the same texture. Should there be a discernible difference in the texture when it’s cooked 20-30 minutes? Either way, thank you for the recipe; it was scrumptious and I will definitely make it again! Really lovely recipe. It reminds me of my grandmother and a polenta dish she used to make. Of course anything with mushrooms is divine. Thank you for this scrumptious treat. This was so good! I didn’t have tarragon so I made a herb mixture of thyme, oregano, and sage from my yard to the mushrooms instead. The ingredients list said shallot so I minced that up but then couldn’t find where in the mushroom directions to add that so I just sauteed it for a couple of mins first thing. Thanks for the yummy meal! Hi. This looks amazing. I’m using your recipe as my first attempt at cooking polenta. Question though.. do you simmer the polenta once adding to the boiled water? I’m assuming yes, but since I’ve never made this, I thought I should ask. The instructions state add polenta to boiling water and continue to cook for 20-30 minutes.. just not sure at what temp. Thanks for the inspiration here! Yep – thanks for bringing this up – I’ll clarify it in the recipe. Simmer on low, stirring pretty often (you want to make sure it doesn’t burn to the bottom of the pan). Hope you like! I loved!! Thanks so much for your quick reply 🙂 One other thing I was wondering is when to add the shallot. It is listed under ingredients, but the instructions have no mention of it. I added it when I put the mushrooms in. Whatever way it turned out delicious!! oops! someone else brought that up, I had thought I had fixed that – you did it right – I add it with the mushrooms. Glad you liked it! 1.A “few teaspoons of salt” is far too much. I added 1 1/2 teaspoons and it was salty enough. 2. The classic way to make polenta is by adding it to lukewarm water to avoid lumps. I tried your instructions to add it to boiling water, and it was full of lumps. I used a whisk, and tried really hard, but I couldn’t get them all out; the only thing that helped was the back of a wooden spoon. I also had to add about a half cup more of water. 3, The polenta itself was only enough for 3 people. The quantities you mention might be good for small individual pots, but not if you use the kind of soup bowl that I used. I’d start with 1 1/2 cups of polenta and add another 1 1/2 cups of water. I served it differently – the polenta in the center of a large flat-bottomed soup bowl with the sauteed mushrooms on top, a slice of goat feta, 3 thickish slices of fresh yummy tomatoes, and green beans (sauteed in the same frying pan as the mushrooms around the bowl. It was lovely and we cleaned our plates! This looks incredible! I’m going to use your recipe as inspiration for a dish I’ll make for tomorrow’s dinner. Thanks for sharing! I’m assuming you cooked the shallots with the mushrooms? yep (sorry!) just added that step to the instructions. 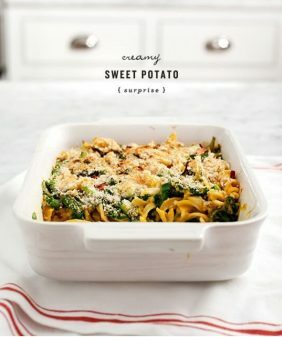 Just made the vegan version of this and it is so delicious! 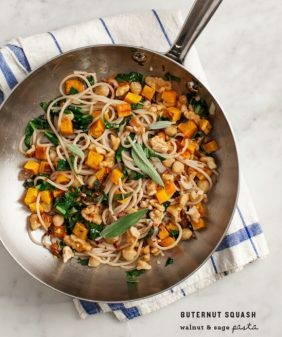 It’s hard to come across a nice comforting vegan dish and this one hit the nail on the head, thank you!! Hi! I was wondering how well this dish holds up as a make-ahead and reheat option? 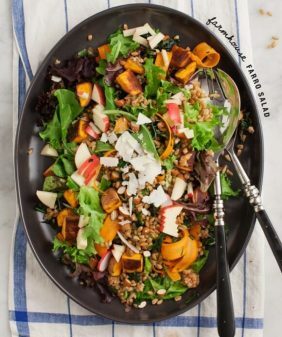 I’d love to prepare it 24 hours ahead of time and reheat for thanksgiving dinner. Hi Megan, I’m not sure this one is the best make-ahead option – the polenta won’t be as creamy, it’ll harden and become a little more gelatinous in the fridge for 24 hours (ie, it’s how you make polenta fries after it firms up). Loved this! I did the extra step of making a wine/butter addition to the mushrooms and thickened into a sauce. Poured it over the polenta like gravy over mashed potatoes. Its in my recipe book for many future meals. Thanks! Oh my gosh this looks amazing! I have some polenta that I’ve been meaning to use and this looks like the perfect recipe for it! This looks so good! Going to make some this week.